GIGANTICONTEST We want manuscripts: Lots of Manuscripts. BUT....Quality stuff Only one rule....NOTHING DATED... AND THE PRIZES? 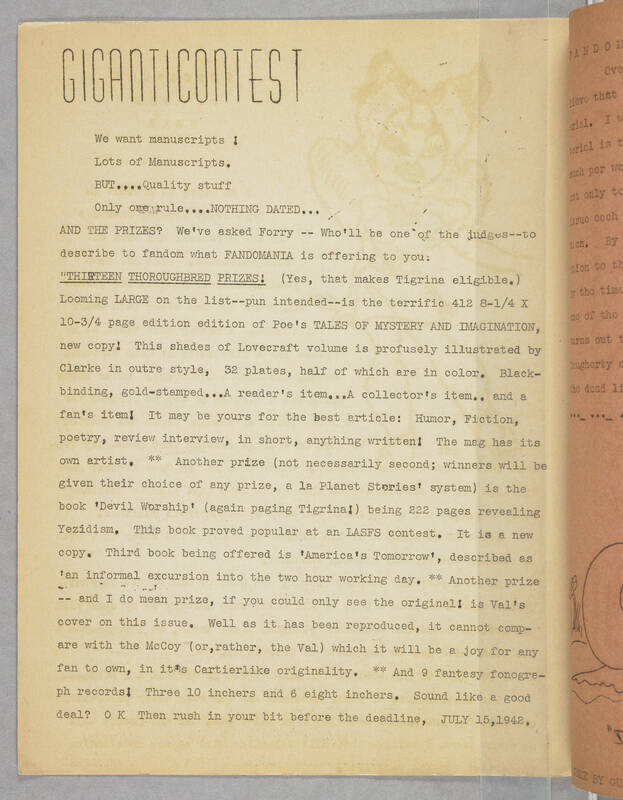 We've asked Forry -- Who'll be one of the judges--to describe to fandom what FANDOMANIA is offering to you: "THIRTEEN THOROUGHBRED PRIZES: (Yes, that makes Tigrina eligible.) Looming LARGE on the list--pun intended--is the terrific 412 8-1/4 X 10-3/4 page edition edition of Poe's TALES OF MYSETERY AND IMAGINATION, new copy: This shades of Lovecraft volume is profusely illustrated by Clarke in outre style, 32 plates, half of which are in color. Black-binding, gold-stamped...A reader's item...A collector's item..and a fan's item! It may be yours for the best article: Humor, Fiction, poetry, review interview, in short, anything written! The mag has its own artist. ** Another prize (not necessarily second; winners will be given their choice of any prize, a la Planet Stories' system) is the book 'Devil Worship' (again paging Tigrina!) being 222 pages revealing Yezidism. This book proved popular at an LASFS contest. It is a new copy. Third book being offered is 'America's Tomorrow', describe as 'an informal excursion into the two hour working day. ** Another prize -- and I do mean prize, if you could only see the original! is Val's cover on this issue. Well as it hsa been reproduced, it cannot compare with the McCoy (or,rather, the Val) which it will be a joy for any fan to own, in it's Cartierlike originality. ** And 9 fantasy fonograph records! Three 10 inchers and 5 eight inchers. Sound like a good deal? O K Then rush in your bit before the deadline. JULY 15,1942.